Lawyer convicted of tax offenses keeps photo with two founders of Hamas as his Twitter profile pic. 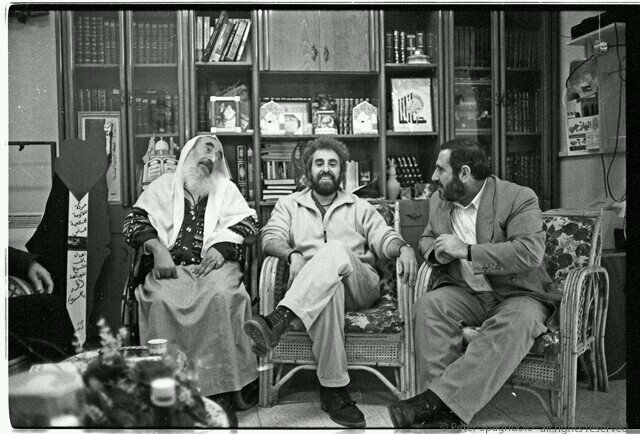 One chapter in the saga of Stanley Cohen has closed, another started. Cohen was to report today to prison to begin serving his 18 month sentence, the result of a plea bargain, for concealing and failing to report large cash transactions and failing to file income tax returns for several years. Cohen pledged during his criminal case that he would rather serve 18 months than dine with a Zionist. Pray for Palestine and Bless the Resistence. Up the Rebels everywhere. They cannot stop us. The wisecracking attorney, who was raised in a moderately observant Jewish family in Westchester County, New York, today describes himself as an atheist and an anarchist, but is still proudly Jewish culturally and socially. So, what exactly is the attraction for him of this violent, authoritarian, conservative religion-focused, sexist and anti-gay group with a founding charter widely denounced as anti-Semitic — whatever he thinks of Israel? “Must be more of that Zionist conspiracy,” Jacobson wrote. So what’s next for Stanley Cohen? There’s a petition for him to be pardoned. Who knows? In the top pic, I can’t tell who is NOT a child murdering terrorist. For once I find myself in agreement with this twit: “Up the rebels, everywhere!” I would personally recommend an AR-10 or an AR-15 using 300 Blackout rounds, but any round will really work. Blades are good too! Why is it that so many of these hyper-educated people are complete idiots? A worthy thought. To the extent I pray, I pray that Palestine will revolt against the madness that Cohen embodies, that they string up all like Cohen from lampposts, and give their children the gift of rationality and the pursuit of peace. These items are great ideas. But they’re off the table, as is the environmentally unsound lump of coal Cohen deserves. Instead maybe we can hope that Cohen serves his sentence as a peaceful, cooperative, non-inflammatory cautionary tale. Yeah, I know, bwaaaahhhaahhhaah. One may always hope, though. Little do Prison Muslims know that he’s a plant to gather inside info. Wow, does anyone else know about this? Just wow! Maybe we need to keep quiet about this, eh? I hope this doesn’t get posted all over Twitter. May he drop the soap in the shower daily – after the water is turned off. Cohen probably wanted desperately to be a big fish in a small pond. Even a terrorist pond. “Political prisoner” — lol. Him and Shatansky. If he would rather spend 18 months in prison than dine with a Zionist, maybe they should find a Zionist for his cellmate. Maybe if he made a video that the administration claimed started an attack on an American consulate, he’d be a political prisoner… Otherwise, he’s just an anti-Semite. Mark Basile Yousef might approve of this message. Is there any way Congress could prevent Obama from pardoning this scoundrel? You can bet he wants to. a zionist would never invite him to dine, nor would any other civilized person.